It was also noticed that many of the motorists rushing to queue up for the product had no idea of the cause of the sudden scarcity, and the station’s owners were unwilling to talk. “They are telling us that there is fuel everywhere, thank God you said you are a journalist; can you see the product here now? At least you saw us in the queue sweating inside our vehicle to get the product. “We need petrol to power the generator to freeze the food inside our refrigerators, and I cannot even stand the queue at the gas station. You can see everyone sweating here to get the product. “Honestly, I am tired of this country — because it seems it is only we the common man that bears this brunt and those at the top don’t feel what we are feeling. And is this the next level that they came to promise us. Niyi Adesida, a commercial driver popularly known as ‘taxi diver’, said the long queues at the gas stations forced him to resort to getting the product from the black market. 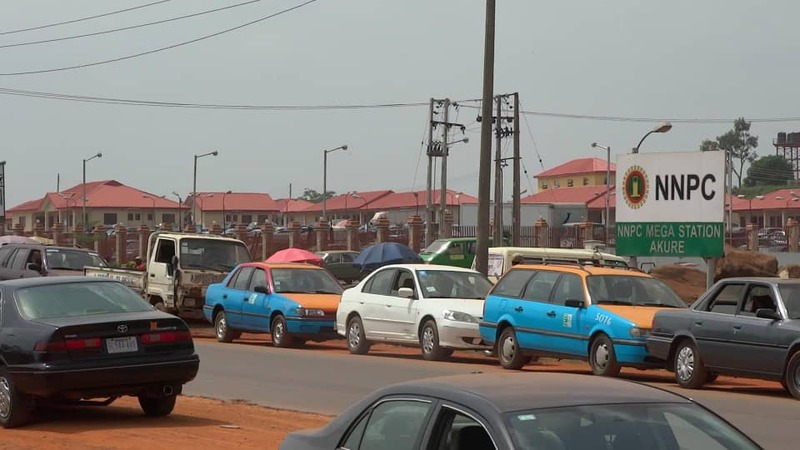 “The scarcity is already bitting hard on us as taxi drivers, and the N50 per drop is no longer comfortable for us becuase we now get the fuel at the rate of N180 and N200 per litre from the black market. Shina Amoo, Chairman of the Independent Petroleum Marketers Association of Nigeria (IPMAN) in Ore depot, told SaharaReporters on the phone that the “slight” petrol scarcity was that the product was not readily available in the depots. “My brother, the truth of the matter is that the product is not available for consumption and we are getting the ones we have from the private depot,” he said. A statement signed and issued by Doyin Odebowale read: “The Ondo State Government views, with grave concern, the latest attempt by some unscrupulous persons to create panic through the hoarding of PMS, fuel.